Or a smaller shared examination centre. End-of-semester Officially Timetabled Examination Accommodations Closing Dates. In order to receive exam accommodations for end-of-semester officially timetabled exams, students must register fully with the Disability Office by the following closing dates. Students with temporary disabilities (e.g. broken hand etc.) should email [email protected] to apply for temporary exam accommodations. Please note-closing dates are strictly adhered to. For timed in-class assessments, the responsibility lies with the student to inform their lecturer of their exam accommodations. The student must approach the lecturer facilitating the exam and request use of their exam accommodations at least 2 weeks prior to the in-class assessment date. Many students do not request supports for in-class assessments as these are short tests with only a small amount of reading or writing required. In addition, extra time only occurs after 1 hour of an examination has passed. Most in-class exams are less than 60 mins and therefore extra time does not apply. Guidelines for students using a computer to type their exam answers. At the start of the exam the PCs will be logged on. The Assistive Technologist is responsible for logging onto the PCs. The computers in the exam venue are restricted so that students do not have access to the Internet or the G:\drive. Students are only permitted to use MS Word and are not permitted to use any other programs on the computer during the exam. In addition, MS Word proofing tools are inaccessible to students typing exams as the use of spell check etc. is not permitted. Students use the computer to type their exam answers. Students can decide to alternate between writing and typing. A USB key to save a backup copy of the answer file. Please click here to see guidelines for saving and printing exam answers. Students that are approved for a waiver on spelling and grammar must attach their stickers to their answer booklet. Typed answers are to be placed into the answer booklet. Students must also type their name, student number, course and date on any printed pages. The printer is set up in IT221. All exam computers have access to the printer. After printing the exam answers the student must sign the paperwork entitled “Printing of typed examination answers” in the company of the Invigilator. If a student has a technical difficulty during the exam, they should alert the Invigilator immediately and the Assistive Technologist or Computer Services Technician will be contacted as appropriate. The Assistive Technologist will be available at the beginning and end of each exam session to assist the student and can be called at any time during the exam. Students that have 'Extra Time' (10 minutes per hour) must bring their 'Extra Time' card to every exam. Students are bound by WIT Examination Regulations. Students must attend any information session(s) and receive training in the use of an electronic reader (ER) before use in an exam situation. Students are only permitted to use the electronic reader feature of Read & Write using headphones provided. At the start of the exam the Assistive Technologist will log onto all computers. The computers in the exam venue are restricted. Access to the Internet or G drive is blocked. Students are only permitted to access Read & Write and the MS Word version of the exam paper and are not permitted to use any other programs on the computer during the exam. An exam image has been set up where MS Word proofing tools are inaccessible, for example, spell check and thesaurus. Students may use the Electronic Reader to re-read the questions as many times as necessary. Students only use the computer to electronically read their exam paper. All answers must be handwritten. Stickers showing waivers on spelling and grammar are to be attached to answer booklets. Keyboards will not be accessible to students and will be physically placed out of reach by the Assistive Technologist or Invigilator. If a student has a technical difficulty during the exam, they should alert the Invigilator immediately and the Assistive Technologist or Computer Service technician will be contacted as appropriate. The Assistive Technologist is also available at the beginning of each exam session to assist the student in opening the electronic reader and also in opening the soft copy of the exam paper from the USB key. Students will be allowed an extra 10 minutes per hour in each exam. In order to avail of extra time students should be in possession of an Exam Extra time card for the current academic year. 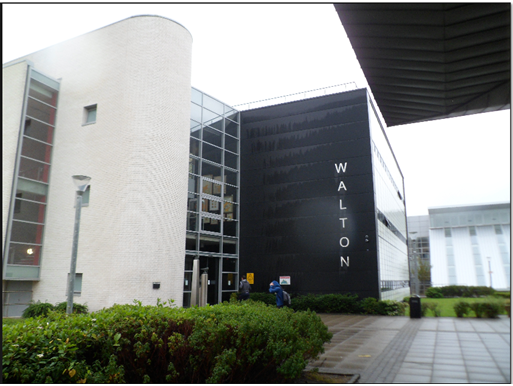 The Walton Building is situated on the main campus, it is also known as the IT Building.